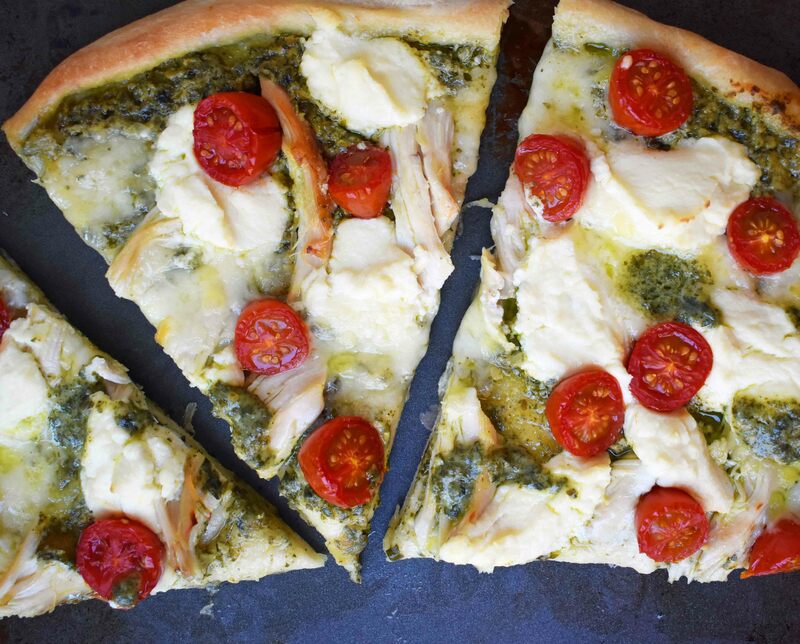 This Chicken Pesto Pizza calls for only 5 ingredients! 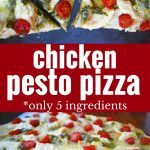 A popular, quick and easy weeknight dinner or for a Friday night pizza party that everyone will love. 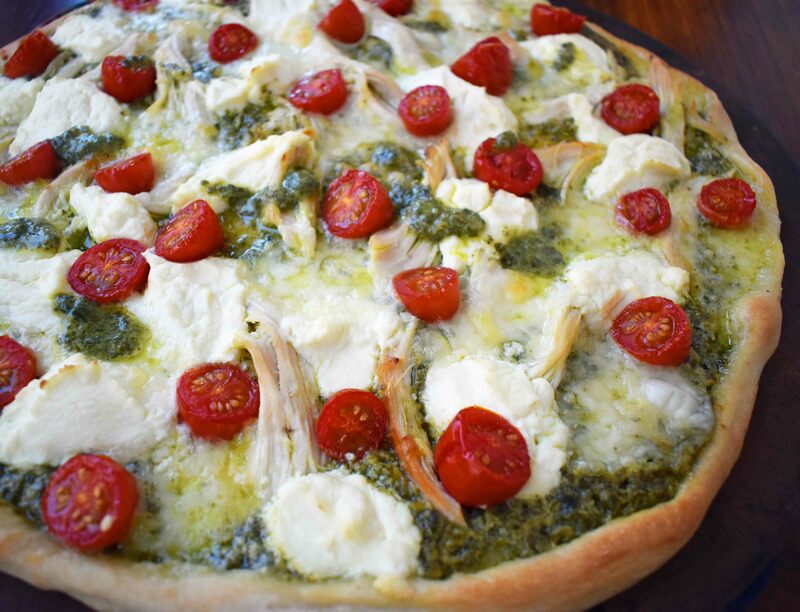 One of our favorite pizzas to order at Oregano’s Pizza Bistro in Arizona is their famous chicken pesto pizza. Has anyone tried this heavenly goodness? 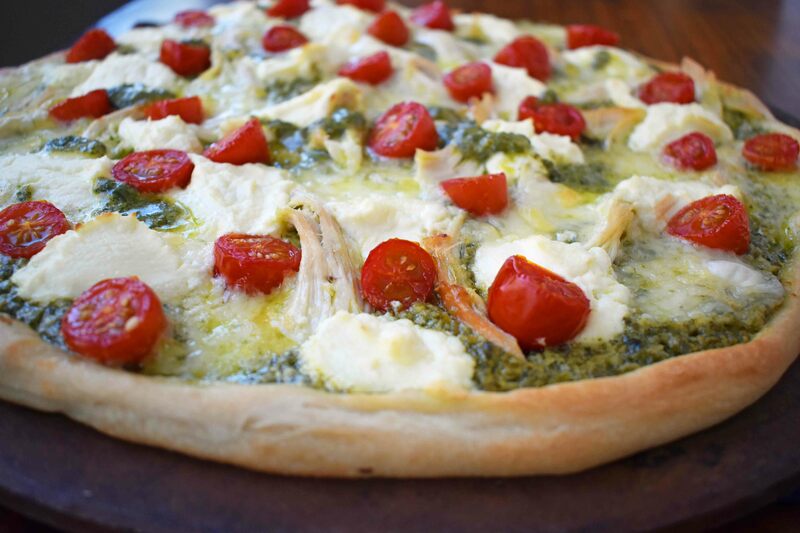 It is full of two types of cheeses, freshly made pesto sauce, and tender chicken. Since my kids are huge fans of pesto sauce, I had to make it at home for the fam. It became a huge hit! We took a few major shortcuts and one of them was using store bought pizza dough. You can knock yourself out and make your own but since it is summer vacation and all my kids are home, I am looking for super easy meals. If you want a foolproof pizza dough recipe, here is my favorite recipe — Homemade Pizza Dough. You can find the refrigerated pizza dough at almost every grocery store, usually near the deli section. You can also use frozen pizza dough. I use fresh Buitoni pesto sauce in a container because it makes this dinner that much easier. Spread it all over the rolled out pizza dough. Top it with rotisserie chicken, dollops of creamy ricotta cheese, and fresh mozzarella cheese balls. We are talking about only 5 ingredients, people! Mind blowing. It is important to cook homemade pizza a high heat to ensure a chewy, crispy crust. We crank the oven to 450 degrees and cook the pizza until the cheese gets nice and bubbly. Set the timer for 15 minutes and check it every minute until it looks golden brown. Some people LOVE tomatoes and some people despise them with a passion. If you love them, add them to the pizza because the tomatoes add a fresh element. I recipe tested the pizza with and without the tomatoes and it was fabulous both ways. 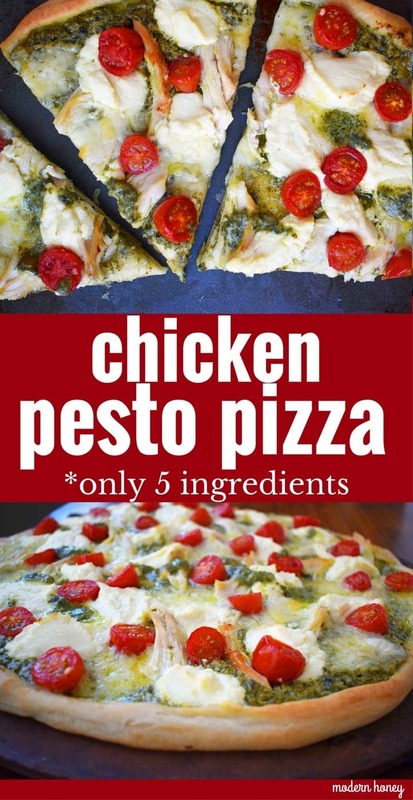 You can always add a sprinkle of red chili flakes to this Chicken Pesto Pizza for a little heat too. 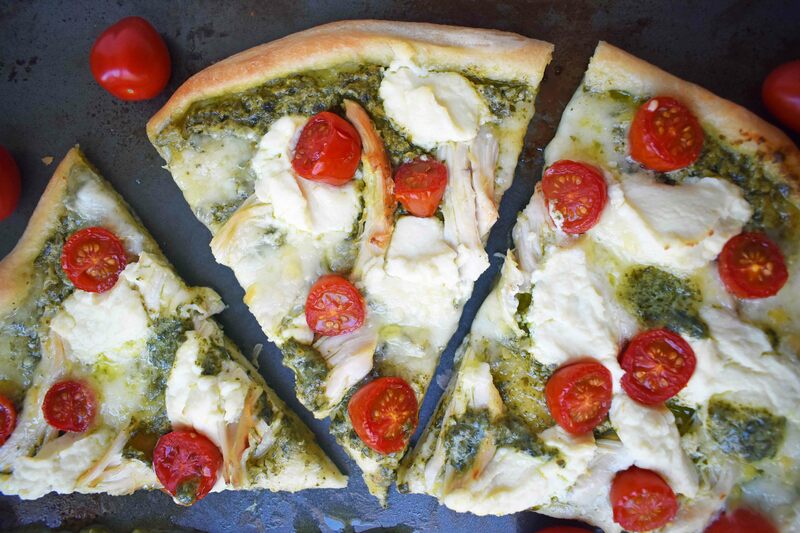 Chicken Pesto Pizza made with only 5 ingredients and full of flavor. Spray round pizza stone or pizza stone with non-stick cooking spray or drizzle with olive oil. Place pizza crust on pan. Using a rolling pin, roll dough onto edges of pan until it makes a circular shape. 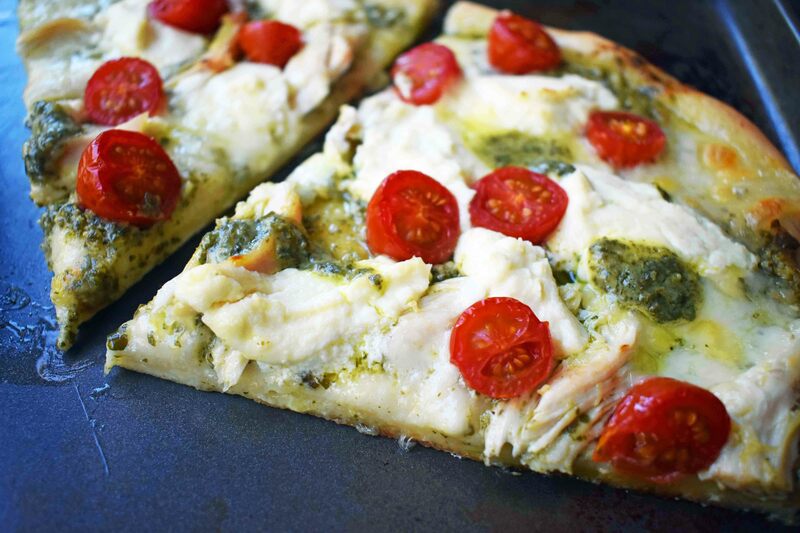 Spread pesto sauce over pizza crust. Top with rotisserie chicken, dollops of ricotta cheese, and mozzarella cheese. Sprinkle on tomatoes, if so desired. Bake for 15-20 minutes, until crust is golden brown and cheese is melted.